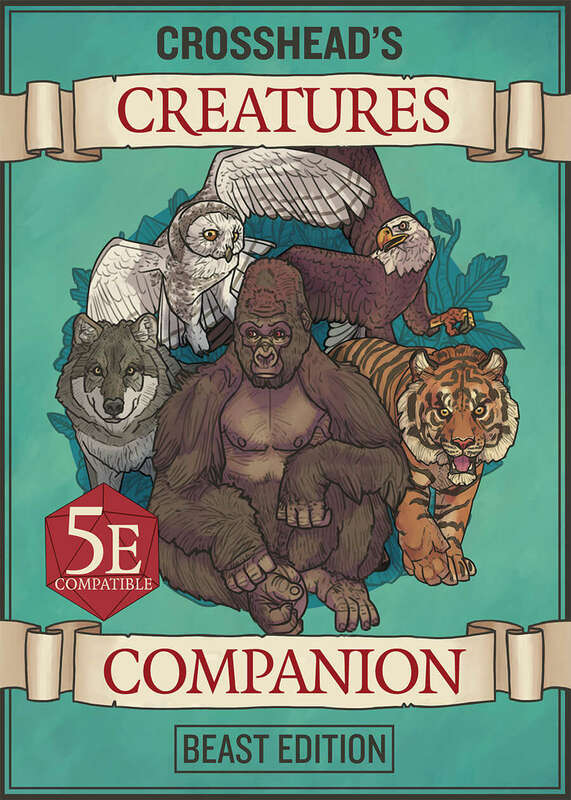 The Creature Companion is a collection of simplified stat cards with artwork for 88 beasts (including dinosaurs & giant beasts) for 5E. it is a way to make shapeshifting a lot more fun for players and putting beasts into any encounter a lot more dynamic for a DM. The layout was designed with print in mind, with the aspect ratio of poker size cards, but can also be easily used on a smartphone/tablet. The digital product doesn't just contain a booklet with all the creature cards (back and front) but also a Zip file that includes all the digital stat cards (for ease of use on a tablet or phone). You can also find a legend of the icons that were used in the layout to highlight specific stats and actions in the preview of the product. PDF Download includes A PDF with all beasts in the deck and a ZIP file with JPG's of said beasts. Printed Cards are US Poker sized, Embossed Card Stock, 310 gsm, black core and are neatly tucked away in a tuck box for ease of use. These look Great, great addition to your work of Dungeons and Battle Maps.